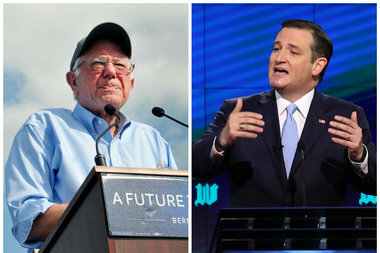 As Donald Trump rolls into town Friday, Presidential hopefuls Bernie Sanders and Ted Cruz are speaking at events in the Chicago area Friday night, too. CHICAGO — Donald Trump isn't the only presidential hopeful rolling into town tonight. As Donald Trump takes the stage at the UIC Pavilion, Democratic presidential candidate Bernie Sanders and Republican presidential candidate Ted Cruz will be speaking at events in the Chicago area Friday night, too. Vermont Senator Sanders will host a free rally at Argo Community High School in suburban Summit, according to his campaign. The event, with special guests Ezra Koenig and Chris Tomson of Vampire Weekend, will kick off at 5 p.m. Friday. Sanders is also expected to hold a rally Downstate at the University of Illinois at Urbana-Champaign Saturday. Cruz wil appear at a high-dollar fundraiser for the Illinois Republican Party honoring Gov. Bruce Rauner at the Palmer House Hilton in Chicago Friday night. Cruz was the only GOP presidential candidate to accept the invitation of Illinois Republicans, according to the Chicago Tribune. The event is expected to be closed to reporters. The Texas Senator is also expected to appear at the Northwest Suburban Republican Lincoln Day Dinner in Rolling Meadows Friday night. Trump will take the stage at the UIC Pavilion at 6 p.m. Friday. Hillary Clinton stumped in north suburban Vernon Hills Thursday night.